To be able to enjoy 5 weeks of amazing, healthy, easy to make recipes like this, join my 30 day online "Your Best Life" program starting Monday, June 5 (the link is in the comments). You will also learn a wealth of other naturopathic focused health related information that I share to the group. 1. Preheat oven to 350 degrees F and brush a baking dish with coconut oil (use an 8x8 pan for 16 blondies). 2. Add all ingredients to a food processor and process until smooth. 3. Spread the batter evenly into the pan. (The batter will be very sticky, so brushing a spatula with coconut oil first will help.) I added a bit of coconut milk to the batter because I thought it was too sticky, but I think I had to bake it a bit longer because of that. Sprinkle extra coconut over the top and press in gently. 4. Bake for 20-25 minutes or until toothpick comes out clean and edges are slightly browned. Let cool for 20 minutes, then cut into squares. Sign up for "Your Best Life"
This week’s baking project was a healthy version of Chocolate Cupcakes. They received 10 thumbs up from my family (probably 12 if we could see the baby’s thumbs!). 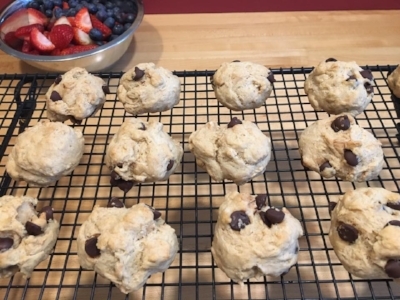 They are egg free, dairy free, and can be gluten free (just replace the all purpose flour with a gluten free blend), and are great for entertaining, school snacks, or just satisfying a chocolate craving when you need one. If you need them to be nut free, you can substitute another gluten free option for the almond flour (brown rice or amaranth can be options). You can click here for a copy of the recipe. Let me know what you think when you try it out at home! If you have watch the video, you will see that doing it with 2 kids instead of 1 was a little more challenging. They were both competing for screen time:) I love that they get so excited to help me bake though. I truly believe, and have seen in my clinical practice, that the foundation of good health is built in the kitchen. I created the free guidebook called "Healthy Meal Planning and Prepping Made Easier" to share what I do as a Naturopathic Doctor and mom to create healthy meals for my family. If you haven't downloaded the guidebook yet, make sure you do! I am fortunate to have a job as a Naturopathic Doctor where I get to work with people who are very motivated to take proactive lifestyle measures to be healthy. It is true that there are lots of different body types, and that “healthy” comes in all shapes and forms (so does unhealthy), but there is nothing wrong with wanting to see some changes in your body shape from your hard efforts. I frequently have women come into my office feeling frustrated that they aren’t seeing any changes in their weight or body shape. I really believe that it shouldn’t be that difficult, and most often there is a reason for it. I first look at their diet, and the type of exercise they are doing, but it is also worth looking into whether a thyroid imbalance, insulin resistance, or chronic stress (or a combination) is be at play. I am going to address each of these topics as separate videos. Today I am going to talk about what you can do to check if your thyroid is functioning optimally. The Thyroid Stimulating Hormone is produced in an area in your brain called the pituitary gland in response to how much T4 (or thyroxine) hormone is being produced by the thyroid gland. If there is a lot of T4, then less TSH is produced. If there is too little T4 present, then more TSH will be made to try and increase activity. So, it is true that in overt hypothyroidism, the TSH level will be high, and in hyperthyroidism, it will be low. That T4 then needs to be converted into T3, which is the active thyroid hormone. That conversion requires nutrients like zinc, selenium and iodine. Stress, hormonal changes, blood sugar imbalances and illness are also factors that can affect how the that conversion happens. There are other factors at play too – for various reasons, your immune system can produce antibodies against you, instead of protecting you against outside pathogens. There are several autoimmune antibodies that can be made against the thyroid. If they bind to the thyroid receptors, then they will prevent the T3 from binding and being active, even if adequate amounts of it are present. A lot of the patients I see have normal TSH blood levels, but still have many of the symptoms of hypothyroidism, including difficulty losing weight, cold body temperature, hair loss, dry skin and/or constipation. It’s like the thyroid isn’t revving their engine enough. That can be because there is too little T4 getting converted into T3 or because there are antibodies present against the thyroid. The thyroid panel that I like to run on patients includes: TSH, as well as T3, T4, and anti thyroperoxidase antibodies. Once that testing has been done, then you have much more information to determine if the thyroid is functioning optimally or not. If the T4 level is good, but T3 is low, then you can take more of those converting nutrients. If antibodies are present, then I have seen dramatic changes by using herbs that can help break them down, and by eliminating food sensitivities and healing the gut. If stress or blood sugar are issues, then they also need to be addressed. You can quickly see how complex our bodies are, and that things don’t work in isolation. If some of you feel after hearing this, that this may be an issue for you, then I recommend seeing a Naturopathic Doctor to run the blood work, and see what can be done to help you. You also need to make sure that you are doing what you can do eat a balanced diet, exercise in the right way, and manage your stress. I created the “Your Best Life” one program as a way to help people more easily incorporate these lifestyle elements that I see are fundamental to helping patients feel their best - both physically and emotionally. The next group will be starting June 5th, if you would like to join. The link with more information will posted in the comments. I really hope you have found this information useful. Peanut Butter Cup Overnight Oats...one of the quick, easy, delicious and nutritious recipes from this week's meal plan in my online "Your Best Life" program. My 4 year old and me thoroughly enjoyed it this morning (so much so that I forgot to take a picture!). For 5 weeks of family friendly recipes that can easily fit into your busy lifestyle, my next "Your Best Life" 30 day online program starts June 5! Click the link to join and for more info! Click to Join "Your Best Life"
While I eat fairly well most of the time, I am far from perfect (I have a hard time saying no to chips, which is why I try not to have them around too often! ), and it's always good to do a diet clean-up. I recently did a 10 Day Detox with a group of patients from the clinic, today I would like to share what I learned while doing it. The goal over the 10 days was to remove oranges, corn, eggs, soy, red meat, animal dairy, refined sugars, gluten, processed condiments, peanuts, sugar and caffeine containing drinks. I'm going to start by being completely honest with you, I wasn't totally perfect with avoiding all of these over the 10 days. I had my husband's birthday, and a girl's weekend, and I did eat a few foods on the "avoid" list. I was however more conscious of the choices that I did make, and I did notice several changes that I hope to continue now that the 10 days are over. I reinvigorated my love for making smoothies with a variety of fruits and vegetables – for the middle part of the 10 days, the goal was to focus on green vegetables, and only have pears and apples for fruit, so I had to get creative with my ingredients. I added in things like sprouts, parsley, cinnamon, pumpkin spice, in addition to the protein powder and more common things I would use. Most of them tasted really good! It helped me drink more water. This is something I really struggle with, but having all of the smoothies, and just being more conscious of getting 9 glasses a day really helped me increase my intake. My digestion was really happy. I don't have any major issues, but I did notice less gas, bloating and better bowel movements (sorry if that's TMI☺). I have been sleeping amazingly! Even though there are lots of exciting things going on in my life right now, I have been falling asleep no problem, and waking up more easily than I usually do. I'm not sure if that is due to eliminating coffee (even though I drink decaf, it does have some), or because I was eating such an anti-inflammatory diet. Either way, I like this change a lot! Even though the detox is over, I am re-inspired to continue with these changes. We will be offering another 10 Day Detox in the coming weeks, but I know that a strict elimination diet is not something that everyone wants to or is able to do. If you are looking for something that is more of a long term healthy diet, not quite as restrictive, but still focuses on clean, whole foods eating, then my 30 day "Your Best Life" program is perfect for you! The next one is beginning on Monday, and there are still a few spots left. You can join at: Dr. Jennifer Haessler.com or by clicking the link below! The "healthy" Chocolate Chip Cookies from our video yesterday were a hit in our house...and thanks for all of the Ivy love! They are definitely less sweet than a typical cookie, but there was still lots of dark chocolate chip goodness to enjoy! I used spelt flour to make them nut free and school friendly (coconut flour would have worked too), but using the almond flour would be better to increase their protein content and make them even more blood sugar friendly. We forgot to push them down, so that's why they are a bit puffy...I kind of like that though. They will definitely be added to one of my upcoming meal plans for my online "Your Best Life" program. 1.Preheat oven to 350 degrees F and line a baking sheet with parchment paper. 2.Combine the almond flour and baking powder together in a mixing bowl. Mix well. Then add in the remaining ingredients and mix again. 3.Plop the dough onto the baking sheet using a heaping tablespoon. Use the palm of your hand to gently form and flatten the cookies. 4.Place in the oven and bake for about 15 minutes for soft cookies, or 15 to 20 minutes for crunchy cookies. 5.Remove from oven and let cool. Enjoy! Join the "Your Best Life Program" TODAY! Wow! You folks loved watching the video with my little lady yesterday...something tells me that has more to do with her than with me:) Either that or you really love Lemon Berry Coconut Muffins! I'm including the recipe below. If you would like more of these clean eating, tasty recipes, join my next "Your Best Life" online group starting May 1. Not only do you get 5 weeks worth of healthy meal plans, you also get a lot of great information about how to more easily incorporate effective exercise, stress management techniques, tips to help with better sleep, optimizing digestion, time management, and so much more. You can sign up through my website...the link is posted below. 2.Mix all ingredients except the raspberries together in a large mixing bowl. Stir very well until combined. 3.Gently fold in the raspberries. 4.Divide batter evenly across the muffin tray. Press in some extra raspberries into the tops of the muffins (optional). Bake for 35 to 40 minutes. Why Should you Consider Doing a Spring Detox? Although it didn't quite look like it late last week, spring is here! It's a great time to spring clean your house, and to think about spring cleaning your body as well. Your body is constantly detoxifying through your skin, kidneys and digestive tract. Spring and fall are ideal to do a more intense detox because they are times of less extreme weather when your body can focus more of its energy on renewal. Due to what you're exposed to in the environment through the air, your home, and your diet, your body's detoxifying pathways can become overwhelmed. This can cause you to have headaches, lower energy, skin changes, and/or digestive discomfort. Maple Shores Health Centre is offering the 10 day Clear Change Detox Program starting April 18 with Dr. Jennifer and Dr. Stacy. We love that it is only 10 days, as we feel anyone can do anything for 10 days! We have had an amazing response so far, and registration will remain open until Thursday if you would like to join us. Here is a bit more information about what it involves, as well as some answers to questions about the program we have been receiving. Clear Change Kit which includes a detox supportive protein power, as well as an herbal combination aimed at optimizing liver function. When taken as instructed in the guidebook, there is enough of both of these to last the duration of the 10 days. We will be taking part in the detox along with you, sharing our meal plans, and posting detox supporting tips during the 10 days. Why use supplements? Why not just detox with food? Food is a very important part of your health, and definitely where you want to focus in the long term. Due to environmental exposures and stress however, it is easy to become depleted in certain nutrients, some of which can affect how efficiently your liver detoxifies. Using the supplements included in the 10 Day Clear Change Kit helps to restore those important nutrients better and faster than food alone. The diet is very clearly outlined in the program guide. You would start with a basic clean eating diet which removes foods that are more likely to be inflammatory or sensitivities for people (i.e. wheat, animal dairy, red meat, etc.). In the middle of the 10 days when the dosing of the medical food and herbs are highest, you would further limit the types of foods you are eating to the ones that are easiest to digest (fruits, vegetables, fish, healthy fats). At the end of the 10 days, you would re-introduce the foods you have removed. To make it easier, there are delicious recipes included in the program guide, both for meals and for creative smoothies to make with the protein powder. We will also be sharing what we do to successfully make it through the 10 days. You should be eating enough to feel full. This program is not about calorie restriction or deprivation, but rather about eating foods that are really easy to digest so that your body can start to rejuvenate. Can you exercise while doing the program? Definitely! This is not a fast, so it is fine to exercise. Just ensure you are getting enough protein for your level of activity. Why is the program only offered to naturopathic patients? Since we are using supplements, we need to have performed an assessment so that we know there are no interactions with any medications you may be on, and are confident there is no reason why this program may not be suitable for you. We want to be sure that it is safe and beneficial for you. Many people experience increased energy, better digestion, improved sleep, as well as less muscle and joint pain after completing the 10 Day Clear Change Program. It is also a great way to kick start cleaner eating habits, and to see if you may be sensitive to certain foods when you re-introduce them back in. If you are interested in joining the program, please contact the clinic at 519-832-4500, or send us an email and we will get in touch with you. The next program starts April 18, and our plan is to run further programs in the future. We would love to have you join us! Remember due to the long weekend, registration is only open until this Thursday, April 13. Every winter my family aims to take a few weeks off so that we can enjoy some sunshine and time together. We are fortunate to be able to share at least one holiday with both my parents and my in laws. This year we flew to Florida, went on a cruise for a week, and then returned to Clearwater Beach to spend a little over a week with my in-laws. On the cruise ship, my husband and I had an adjoining room with our 3 kidlets. The rooms were both pretty small, but it's easy to live small when someone is making all of your meals, you have space to sit outside and enjoy the sunshine, and lots of activities have been planned for you. When we got back to the condo with my in-laws, there were 7 of us sharing a two bedroom condo…my in-laws had a room, the 3 kids shared a room, and each evening, my husband and I would sleep on a mattress on the floor of the living room – now that is small living☺ While we were happy to get back to our own bed when we got home, amazingly it wasn't that hard to live in such a small space. For one thing, we had a lot less stuff with us…and we could have brought even less than that. It felt like the routine of making meals and cleaning up took a whole lot less time than it does at home where we have a lot more space, and a lot more things around us. If I don't use it, then I get rid of it. I hold on to so many things thinking that I may need them in the future, but every time I see them taking up space in my cupboard or drawer, it causes me a bit of stress. So I have been throwing out or donating any personal care products, gadgets, food, and clothes that I haven't used or worn. I'm aiming to clean out a minimum of 1 drawer or cupboard a day. It can feel so overwhelming to think about spring cleaning the whole house. My goal of one drawer a day feels totally doable, and still gives me a really good sense of progress and accomplishment. I need to think carefully about the sentimental stuff I keep. I have SO many pictures and greeting cards and pieces of kids' artwork that I have stashed away in different boxes. They just sit there, I rarely (never) go back to look at them again, and every time I add something to one of the boxes, it causes me some anxiety. I haven't attacked these areas yet, but as I am going through the rest of my house, it has got me thinking about why I am keeping these things. If I never look at them, do I really think that my kids are going to ever enjoy looking back at 50 years of anniversary and birthday cards that my husband and I have given each other? I think I can get rid of some of them. If anyone has a system that has worked for them to organize these items, I would LOVE to hear about it. If something new comes in, then something old has to go out. I love adding some spring touches to our home, so yesterday I bought 2 bright pillows for our couch, but got rid of 2 that haven't been getting used. The same goes for clothes or shoes or anything else. It really makes me think twice before buying something. It feels so good to be able to open a drawer or cupboard, and easily find what I need. To look in my closet and only see the clothes that I like wearing. It's like I'm literally getting lighter, and not so weighed down by all of the stuff. It saves time too because I don't need to waste time looking for what I need, and it makes it easier to keep what gets used close at hand. Having organized surroundings gives me the headspace to be able to focus on the things that are really important to me and make me happy…which isn't the stuff. It's spending time with my family and friends, cooking, being active, reading, and doing fulfilling work. If you would like some help making space to create "Your Best Life" with healthy meal plans, time efficient exercise routines, stress management tips, and suggestions on how to improve your sleep, digestion, and more, I have another online group starting Monday, May 1. The group has been filling up fast, and the fact that there are several participants who are joining for a second time, is an indication of how effective, motivating, and do-able this program is. Contact me if you would like to go on the waiting list to join when registration opens, or if you have any questions.